Loved for its divine aroma Tulsi Basil is equally as powerful as a medicine as its scent. Tulsi is native to India where it’s able to grow abundantly and year round. Perhaps its most unique quality is Tulsi’s ability to work on both the sympathetic & parasympathetic nervous system. Therefore Tulsi can be used both for stimulating focus in the mind or for relaxation, according to how it is taken. 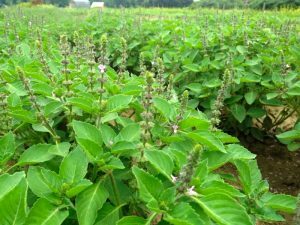 Not officially an adaptogen, Tulsi comes very close and is often referred to as “adaptogenic tonic.” Tulsi’s influence on the autonomic nervous system makes it a great ally for dealing with stress in general. The pungent flavor of Tulsi lends to its use as a carminative that stimulates appetite and digestion. This pungency is warming and moving, helping to move excess heat from the bloodstream and liver as well as opening up the skin & lungs. Tulsi’s opening affect on the lungs removes mucus & makes the plant a useful medicine for cold and flus & acute respiratory conditions. Tulsi is great as a daily tonic or simply as a tea time beverage, as the aroma has a way of putting a smile on everyone’s face! Tulsi makes a divine and super aromatic tea either fresh or dry. Drink simple tulsi tea or try with other calmative nervines such as lemon balm, scullcap, oats and rose. Try adding fresh tulsi leaves to your salads. Also makes a great tincture and delicious glycerine. Infuse into oil to use as a perfume. Simply dab some on the wrists and neck or use a perfume roller. Tulsi infused honeys makes the perfect addition to your teas or as a drizzle on desserts. Disclaimer: The information on this page has not been approved by the FDA. Please consult your healthcare practitioner before using herbal products. We do not endorse the websites linked to in the resources and have not extensively reviewed all the information on external pages for accuracy. Everyone reacts differently to herbs and we do not attempt to be completely inclusive in the information and contraindications for each herb.